Jean-Luc Brédas received his Ph.D. from the University of Namur, Belgium, in 1979. In 1988, he was appointed Professor at the University of Mons, Belgium, where he established the Laboratory for Chemistry of Novel Materials. While keeping an “Extraordinary Professorship” appointment in Mons, he moved to the US in 1999 and became Full Professor of Chemistry at the University of Arizona. In 2003, he moved to the Georgia Institute of Technology as Full Professor of Chemistry and Biochemistry. In July 2014, he took a 2-½ year leave of absence to King Abdullah University of Science and Technology (KAUST) where he served as Distinguished Professor of Materials Science and Engineering and Director of the KAUST Solar and Photovoltaics Research and Engineering Center. At Georgia Tech, where he resumed his activities in January 2017, he is Regents’ Professor of Chemistry and Biochemistry and holds the Vasser-Woolley and Georgia Research Alliance Chair in Molecular Design. He is a Georgia Research Alliance Eminent Scholar since 2005. 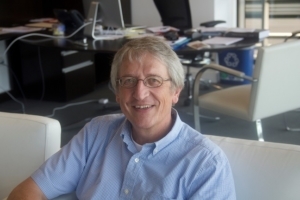 Jean-Luc Brédas is a Member of the International Academy of Quantum Molecular Science, the Royal Academy of Belgium, and the European Academy of Sciences. He is the recipient of multiple awards, including the 1997 Francqui Prize, the 2000 Quinquennial Prize of the Belgian National Science Foundation, the 2001 Italgas Prize, the 2003 Descartes Prize of the European Union, the 2010 Charles H. Stone Award of the American Chemical Society, the 2013 David Adler Award in Materials Physics of the American Physical Society, and the 2016 Award in the Chemistry of Materials of the American Chemical Society. He is a Fellow of the American Chemical Society (Inaugural Class of 2009), American Physical Society, Optical Society of America, Royal Society of Chemistry, and Materials Research Society (Inaugural Class of 2008), and an Honorary Professor of the Institute of Chemistry of the Chinese Academy of Sciences. He holds Honorary Degrees from the University of Linköping, Sweden, and the Free University of Brussels. He has published over 1,000 refereed articles (that –as of May 2018– have garnered over 70,000 citations, leading to a Web of Science h-index of 121) and given over 500 invited presentations. Since 2008, he has served as an Editor for “Chemistry of Materials”, published by the American Chemical Society. The research activities of the group deal with the structural, electronic, optical and interfacial properties of novel organic (nano) materials with promising characteristics in the field of electronics, photonics, and information technology. Our work is devoted to theoretical investigations based on powerful computational techniques derived from quantum chemistry and condensed-matter physics. With such an approach, we are able to model compounds and materials reliably in order to understand and/or predict their electronic and optical properties. The major part of our studies involves polymer and oligomer materials (plastics) with a π-conjugated backbone. Our goal is to determine the nature of the physico-chemical mechanisms leading, for instance, to: high charge-carrier mobilities in the semiconducting or metallic regime; strong luminescence or photovoltaic response; outstanding nonlinear optical properties; specific surface interactions with other materials, such as metals or conducting oxides.